I’ve had a bit more time now with my (still shiny, still new) Numark AVM02 – or “Avmo” as it’s been dubbed by my bandmates – and have some more thoughts to offer, if you will hear them. If you haven’t heard the original thoughts or seen the unboxing photos you may like to check out my “First Impressions” review. Obviously the biggest question I’m going to get is “how does it compare to the Edirol V4”, so I’ll come out straight away and disappoint those who are looking for that comparison: This article will focus mostly on the AVM02’s own strengths and weaknesses, and while some comparisons to the V4 and other video mixers may be drawn, you’ll have to make your own conclusions at this stage. I will be doing a full head to head features-and-quality shootout vodcast in the coming weeks, so I’ll save the serious V4 comparisons until then. The AVM02 combines a basic DJ mixer with what I guess could be described as a “DJ Style” video mixer, and is able to combine 4 Video channels and 4 Stereo Audio channels, mixing with independant (but linkable) Video and Audio crossfaders. Additional XLR-1/4″ “DJ Mic” input with Treble/Bass EQ and Gain. So as you can see, you’re getting a pretty hefty chunk of mixer for your money. As an initial, fiscal comparison with other vision mixers on the market, the Edirol V4 is US$1,249 list, Korg Krossfour is $900, and pioneer’s VSW-1 (marketed to go with their DVJ DVD turntables) is $499. As mentioned in my first impressions, this is a solid, professional quality mixer. The crossfaders are smooth and quite fast, but not free enough to travel across with a flick. Both Video and Audio crossfaders have a 3 position switch for slope/curve selection. There’s also a “fader link” button, which links both to the position of the audio fader. Hello Fader Link button, we are glad you have come. The channel faders are quite stiff which is fine for many mixing styles, but turntablists will probably notice this, the not-lightning-quick 55mm crossfader and the general expansive layout and look elsewhere for their audio mixing needs. The Ch 4 fader on my unit is noticeably stiffer than the others, which is slightly worrying, but not considerably so as I’m unlikely to use it very often. PFL buttons are lit by internal LEDs when activated. The EQ/Trim knobs all feel robust, and EQs have center detents. All video buttons are plastic, and while they feel very solid they have a noticeable click, and need quite a firm touch to activate them. This, coupled with the lack of transform/take buttons rules out fast, hyperactive flash-cuts between sources. You can still select sources directly on the channel to cut between them, but the firmness of the buttons means this may not be as quick as you’d like. Overall the unit is built like a small, shiny, conspicuous, unarmed tank, and feels like it would stand up to plenty of abuse in a live rig or club environment, and at 5.5Kg (12lbs) with fixed rack ears it’s obviously intended for this kind of installation or to be road cased, rather than being carted around in a backpack. 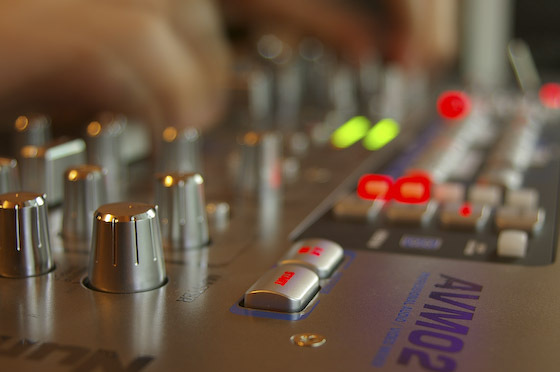 The audio section functions like a standard DJ mixer. If you’ve used one before you’ll know exactly what to expect. If you haven’t, KAM.co.ulk has some handy tutorial PDFs you can download and read. There’s nothing really missing, but nothing outstanding either. I would have appreciated an Effects send, but I’m thinking I could kludge something together using one of the headphone outputs and PFL select buttons. The video mixer is relatively standard fare as well, with the noticeable exclusion of a Take/Cut function. The source buttons are lit internally so you can quickly see where you are and where you’re going, and the crossfader curve is switchable so you can do sharp cuts or long blends. In auto-fade mode the crossfader selects the fade length, which ranges from about 0.25 – 9 seconds, and is triggered by the “start” button. The auto fade just happens once (it doesn’t bounce back and forth like the V4’s BPM fade) and it conforms to the selected crossfader curve. No surprises here, it does what it’s intended to do in a straightforward manner. The promised 96 wipe patterns indeed exist though 6 basic wipe patterns, with 4 directions each, and a 4 stage “multiplier” button. Err, yay? I’m planning to follow this article up with a video review and V4 quality comparison, so I’ll be able to take you through the unbridled joy of multiplied wipe patterns and on board effects then. However, the most critical wipe/effect issue can be easily demonstrated with text: There is no indication of what version of the wipe you currently have selected. This also applies to the effects which have multiple levels (strobe, paint, mosaic). The buttons light up to say “yes, you have this effect or wipe selected”, but there’s nothing to show you which one. I’m fully aware that I have my triangle wipe primed and ready to blast its way across the screen, but will it come from the top, bottom, or one of the sides? The same applies to effects, and even the “7 selectable background colours”. The only way to know for sure which colour or effect you’re going to get (without having your “what setting am I on again?” test fade visible to the entire audience) is to repeatedly press the button in question until it turns off, then (having previously memorized the effect or background colour order (black/off, blue, weird dull red, horrible purple, not too hideous lime, feeble aqua, diseased greeny-yellow, white)) you have to repeatedly press the button the requisite number of times, hope all of your button presses registered, and, hopefully, triumphantly fade in the correct colour or activate the right effect. I’m aware that the review has taken a slight turn for the silly, but I’m trying to give you an impression of how ridiculous the effects and wipes feel in comparison to the rest of the unit. Personally I don’t use mixer-level effects very often because I have a better range of effects and more control via either in-computer effects, or my newly aquired Kaoss Pad Entrancer. I still crack out the V4’s Strobe, Mirror or Shake occasionally, but the AVM02’s offerings are so clunky to control that I can’t really imagine even a hardened posterize-junkie getting much use out of them. Ditto for the fruity little Picture-in-Picture/Wipe Position joystick. To me these features feel like Numark is just ticking boxes. They’re not truly useful effects, just gimmicks, but they do allow them to put “built in effects” and “a seriously large number of wipe patterns” on the product’s brochure. Apart from the dodgy effects setup, my only real issue with the unit’s operation is that the buttons don’t seem to register if pushed too quickly. This may be a limitation of the internal processing, but rapid pressing of different source select buttons – while registering a distinct mechanical click – often doesn’t actually change the to the intended source. When they do register there is a small but perceptible latency when switching (cutting) directly between sources. Zee Buttons, Zey Can’t Keep Up With My Superior Skills! MIDI! If I was designing this device I would have scrapped the effects entirely and focussed on truly integrating audio and video for live performance, and the one constant with A/V performance is MIDI. Allowing the unit to be send and receive midi messages would, in my opinion, instantly make it a requirement in any visualist’s rig. Of course I have no idea how much it would cost to implement this kind of change, but surely ditching that effeminate joystick could save some dollars. Responsive buttons: MIDI would obviate this issue as you’d be able to sequence crossfades and cuts, or utilize the buttons of your choosing with an external MIDI controller, but while we wait for MIDI someone really needs to take a look at the feel and responsiveness of those buttons and get them fixed. Crossfaders are fine, but sometimes you just need to make a cut, or a lot of cuts, very quickly, and if you try to do so on an AVM02 it will refuse to play along. Overall I’m extremely satisfied with my purchase. There are definitely improvements to be made and additions to be… added, but at the moment Numark are finding their way in a new market with a single product line, so they’ll never be able to satisfy everyone. They have made some great advances since the original AVM01 (review on VJCentral), and more competition in the video hardware market can only mean good things for VJs. Here in Australia the AVM02 is actually $300 cheaper (street price) than the V4, which makes for a very difficult decision. In the next couple of years I see this product lineup in the video market expanding similarly to DJ mixers, with different layouts, effects and options available for “turntablist” style highly-technical VJing, live looping with onboard sampling and effects, battle-style VJ mixers allowing you to mount your DVD player sideways and tag over your DVD labels like the hiphop kids do… In the meantime the AVM02 is really the only A/V mixer available at anywhere near this price point, and it does a superb job too. If you’re a visualist branching out into the frightening world of audio, a DJ looking to add video to your set, or just someone looking for a solid, competitively priced vision mixer, you should definitely give the AVM02 a try.